Wheat is the third largest U.S. field crop behind corn and soybeans. Internationally, the U.S. ranks fourth in production of wheat, behind China, the European Union and India. Some varieties of wheat are more useful for breads and flours; others species are better suited to noodles and pasta. The growing season of wheat depends on the type of wheat. Hard winter wheat, used mainly for bread flour, is largely grown in a belt, centered in Kansas, that runs from Texas to Montana and the Dakotas. It is planted from the beginning of September through the end of October and is harvested from mid to late August. Hard red winter wheat and other varieties of winter wheat account for 70 to 80 percent of the wheat grown in the United States. Soft red winter wheat, grown east of the Mississippi River, is used mainly for flour used to bake cookies, cakes and crackers. It is planted throughout September until the end of October and is harvested from the end of May through the end of July. Soft white winter wheat, used for flour that is made into cereals, crackers and white-crusted breads, is grown mostly in southeastern Washington state and northeastern Oregon. It is planted from the first of September through the middle of November and harvested from the middle of July through August. 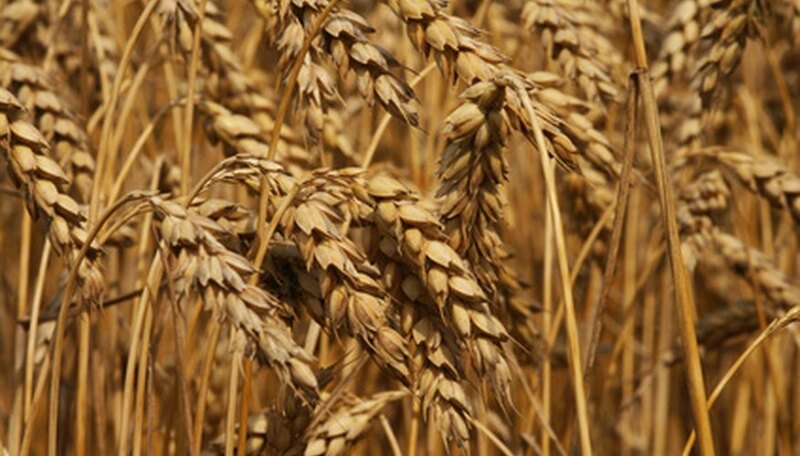 Hard red spring wheat has high levels of protein; flour from this wheat is blended with flours that contain less protein. It is grown in Montana, Minnesota and North and South Dakota. It is planted from the middle of April through the end of May and is harvested from the middle of July through the middle of September. Durham wheat, made into pasta, is grown in Montana, North Dakota and South Dakota. Durham wheat is planted from the middle of April through the end of May and is harvested from the middle of July through the middle of September.